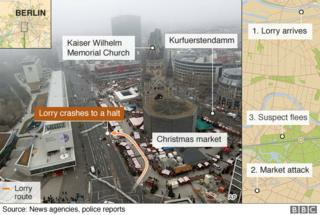 A lorry smashed into a crowded Christmas market in central Berlin on 19 December, killing 12 people and injuring 49, leaving 18 in a critical condition. Identified attacker Anis Amri, a Tunisian, was shot dead by Italian police on 23 December in the city of Milan after a Europe-wide manhunt. So-called Islamic State (IS) has said one of its "soldiers" carried out the attack on Breitscheidplatz Christmas market, without offering evidence. German police had initially detained a 23-year-old Pakistani man, who denied any involvement and was released after questioning. After an inspection of the lorry, which was registered in Poland, authorities discovered legal identity papers belonging to Amri. Amri's fingerprints were also later discovered in the vehicle's cabin. It was thought that Amri, 24, had been injured in a struggle with the Polish driver, who was found murdered in the cab. Amri was shot dead after firing at Italian police officers who had stopped his car for a routine check, the Italian authorities say. He reportedly pulled a gun from his backpack, shouted "God is greatest" in Arabic and opened fire, injuring an officer. A second policeman then returned fire, killing him. Tunisian security forces arrested Amri's nephew and two other suspects on 24 December. Tunisia's interior ministry said the three, aged between 18 and 27, were members of a terrorist cell. How did the market attack happen? At 20:14 local time (19:14 GMT) the lorry, laden with steel beams, crashed into people gathered around wooden huts and stands selling mulled wine and sausages. The market was packed with tourists and locals, at Breitscheidplatz, near Berlin's famous Kaiser Wilhelm Memorial Church. The lorry drove 50-80 metres (160-260 ft) through the market. Witnesses reckoned its speed to be about 64km/h (40mph), as it sent market stalls flying, leaving a trail of debris and casualties. After the lorry stopped, the driver reportedly fled into the darkness of the Tiergarten park. One witness set off in pursuit, then called the police. The Pakistani man was later arrested near the park's Victory Column monument. The lorry's Polish driver, named as Lukasz Urban, 37, was found dead in the passenger seat. Police said he appeared to be the victim of a hijack. A pistol apparently used to kill him was not found at the scene. The German news website Focus says analysis of the lorry's GPS data shows that its engine was started several times on Monday afternoon, suggesting that someone was learning to drive it. At 19:34, the lorry set off for Breitscheidplatz. His full name was Anis Ben-Mustafa Ben-Outhman Amri. He was known to authorities and was under surveillance in Berlin between March and September. Amri was reportedly monitored on suspicion of planning a robbery in order to pay for guns, but surveillance was lifted for lack of evidence. He was facing deportation as of June this year but remained in Germany because of a delay in receiving paperwork from Tunisia confirming his identity. Before arriving in Germany in July 2015, Amri served four years in prison in Italy for arson. Italian officials said he had arrived in Italy illegally by boat in 2011 after fleeing Tunisia during the Arab Spring revolutions. Two Germans - a 32-year-old man from Brandenburg an der Havel and a 53-year-old woman from Dahme-Spreewald - were also among the dead, the state's interior ministry said, without naming them. A German woman from Neuss, near the west German city of Duesseldorf, is also believed to have died. Her son, aged 40, is among the injured. In total, it is believed six Germans were killed in the attack, although five people remain unidentified, according to German website RP Online. Are there Islamist links, as in the Nice or Paris atrocities? The lorry attack in the French city of Nice in July, carried out by a Tunisian-born man, was also claimed by IS. The jihadist group - currently being attacked by Western and Russian warplanes in Iraq and Syria - has urged its supporters to use vehicles to attack Westerners. In November 2015, gunmen and suicide bombers simultaneously targeted a concert hall, a stadium and restaurants in Paris, leaving 130 people dead and hundreds more wounded. The attacks were claimed by IS. Earlier this year, Germany was shocked by four attacks, two of which - by asylum seekers - were also claimed by IS. Alternative for Germany (AfD), an increasingly popular anti-immigrant party, warned that Chancellor Angela Merkel's "open-door" policy towards refugees in 2014-2015 had created a big security risk.